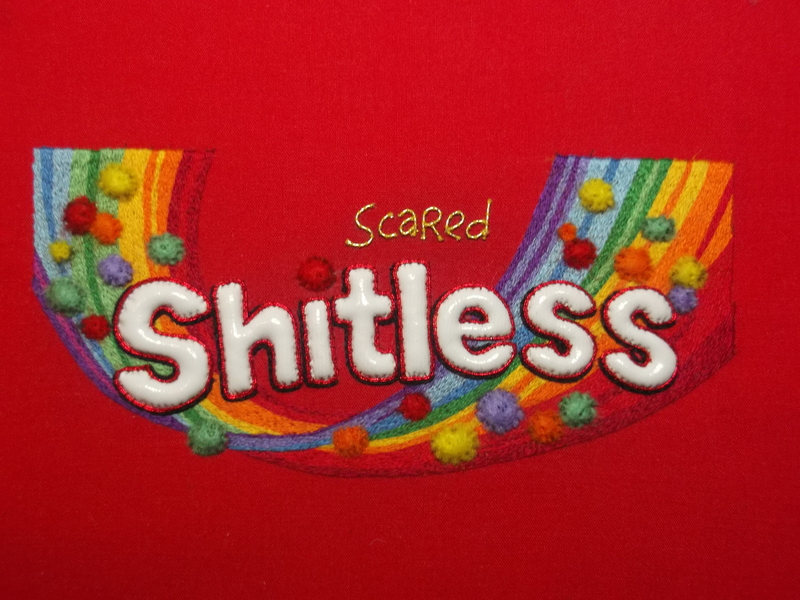 The first of my play-on-words candy wrapper that isn’t a chocolate product: ‘Skittles’. This piece isn’t quite completed yet, but as I’m having difficulty sourcing the materials for the final few touches, I’ll share it for now as it is. Here is the original, from which I re-drew the logo to suit my own sinister sense of humour. Keeping the text as visually close as reasonable to the original seems important, as a casual glance at it is normally insufficient to make the viewer realise ‘what I’ve done’, requiring a second look. If there was any doubt as to the irrational feelings of terror an eating disorder can instil, this summarises it perfectly. 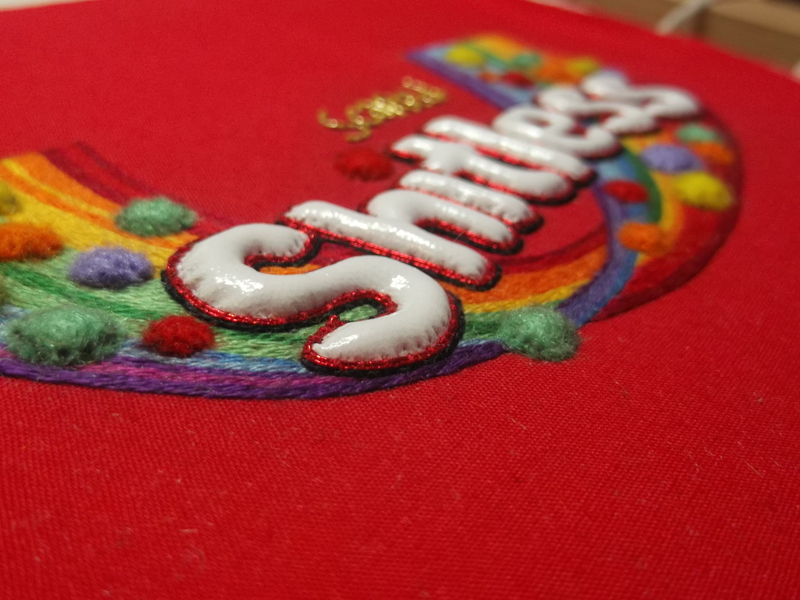 This piece is the most intensely embroidered in terms of background detail of the series so far, requiring an entire rainbow worked flat on the background fabric before the text itself could even commence. Rainbows are generally constructed from refracted light, but I opted for a series of stripes worked in single-stranded embroidery cotton and long-and-short-stitch. The direction of the stitches follow the curvature of the rainbow. 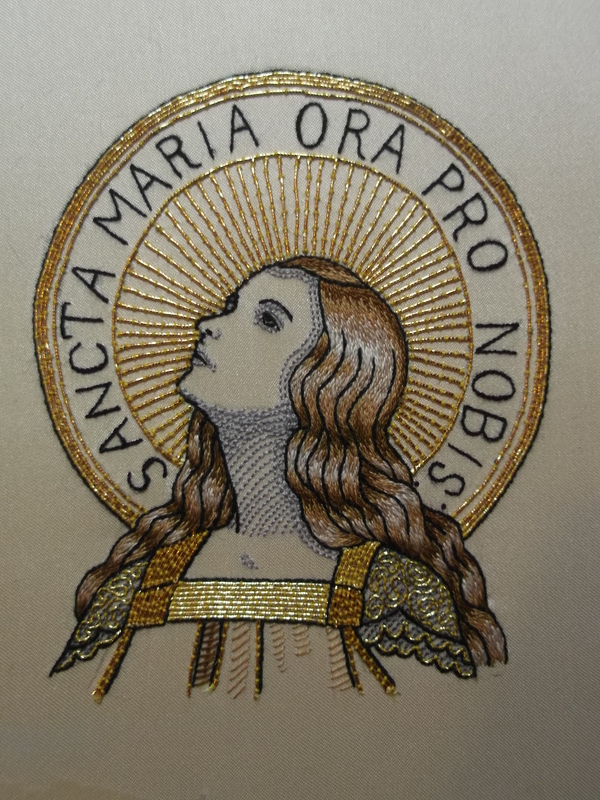 The text is constructed from layers of padding topped with applique’d white PVC. Shiny. 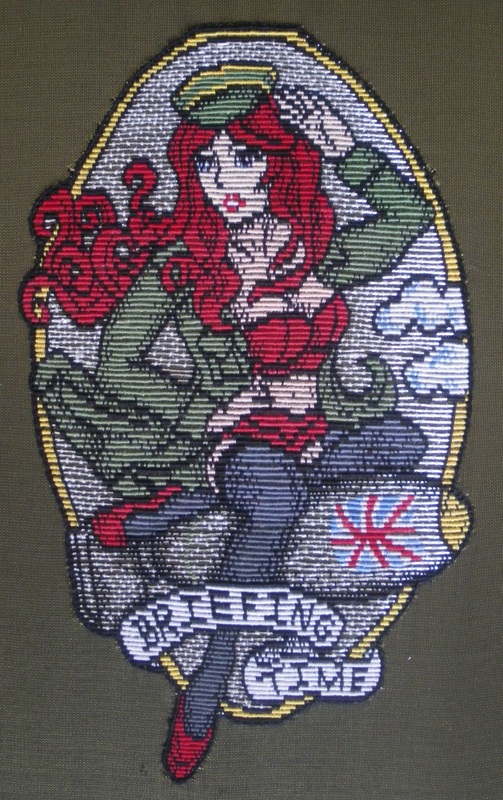 Outlines were picked out in couched metallic passing thread, which I feel ‘brought it to life’. The rest of the chocolate bars have a far greater reliance on the integration of large quantities of metallic elements, which although could have overshadowed the detail in the rainbow, nevertheless did need to be present if only in a small amount to ‘lift’ the design. 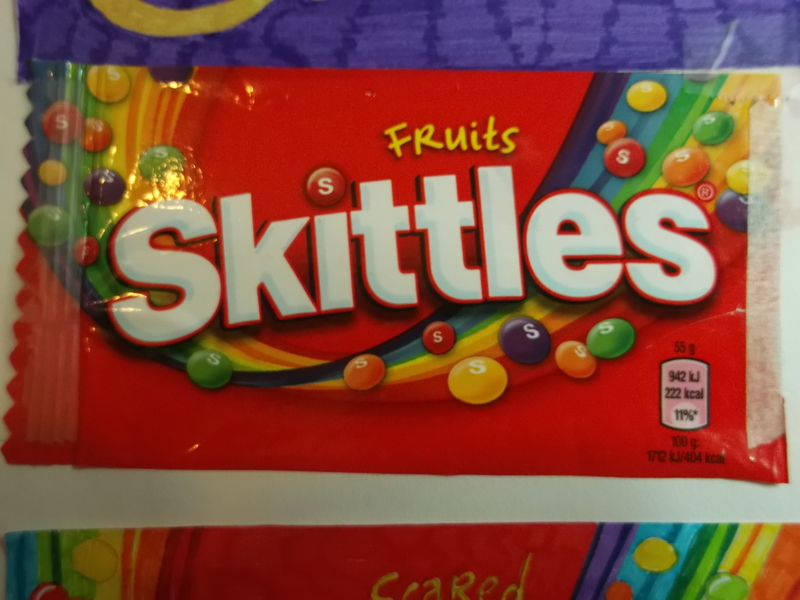 The skittles themselves are also going to be covered in appliqued PVC (which is proving irksome to source over Christmas in the four colours I’m lacking). I did sample out a few alternatives but decided to hold out for the Ebay delivery expectantly. You’re get an awful lot of use out of the nice shiny white stuff!